One July 23rd, 2006, the NOAA ship Hiialakai returned to Honolulu following a 28-day research cruise to the Northwestern Hawaiian Islands. The multidisciplinary expedition included six maritime archaeologists with NOAA's National Marine Sanctuary Program conducting non-invasive survey at Kure Atoll and Pearl and Hermes Atoll. The NOAA team included: Brenda Altmeier (Florida Keys NMS), Dr. Kelly Gleason (Pacific Islands Region NMS), Tane Casserley (Maritime Heritage Program NMS), Lindsey Thomas (Hollings program intern from the University of Georgia), Robert Schwemmer (West Coast Region NMS), and Dr. Hans Van Tilburg (Pacific Islands Region NMS, principal investigator). 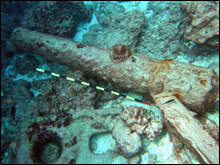 Surveying wreck sites in the Hawaiian archipelago reveals our seafaring history and provides a platform for the message of preservation and comprehensive ocean stewardship. The USS Saginaw is one of those opportunities. The American side wheel steamer USS Saginaw was the first vessel built at Mare Island naval ship yard and the first warship built on the West Coast. The ship captures a critical period of American naval involvement in the Pacific, a rare example of the transitional steam and sail period, and the rare use of inclined oscillating steam engines onboard naval vessels. The Saginaw's service spanned the Pacific and took her to distant ports in China, Japan, and the West Coast from Central America to Alaska. During the Civil War the Saginaw cruised between San Francisco and Panama, protecting the Pacific steam liners from Confederate raiders like the CSS Shenandoah. Her final cruise involved supporting an attempt to develop a coal depot at Midway Island, which had been claimed by the U.S. in 1867. The Saginaw was transporting the team of Boston hardhat divers from Midway back to San Francisco following a six-month effort the clear a channel into the lagoon. 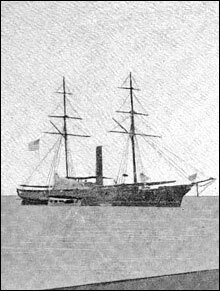 She wrecked at Kure Atoll October 29th, 1870. Survivors spent two months on Ocean (Green) Island, while five volunteers made a perilous open boat voyage to the main Hawaiian Islands for rescue. After a month at sea and their provisions all spoiled, the small crew was virtually incapacitated by the time they reached the main Hawaiian Islands some 1200 miles to the southeast. Four died in the rough surf landing on Kauai. The fifth, coxswain William Halford, made his way to Honolulu and the Hawaiian steamer Kilauea soon brought the crew back from the distant atoll. The dynamic site environment is the single most challenging aspect of conducting any type of research on this heritage resource. Kure Atoll's eastern reef crest is exposed to open ocean swells and strong prevailing winds, and the site features breakers even in the calmest ocean conditions. The remains of the USS Saginaw lie within and under the dramatic spur and groove topography of the immediate reef crest, and often times the divers found themselves bracing against strong ocean surges within the narrow grooves, while overhead the breakers spilled white water. 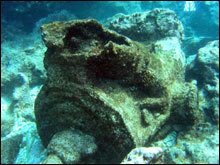 In extremely difficult conditions under the surf zone adjacent to the seaward reef crest, the team discovered and photographed the major elements of the USS Saginaw, including bow and stern Parrott rifled pivot guns, 24-pdr broadside howitzers, steam oscillating engine cylinder, port and starboard paddlewheel shafts, anchors, brass steam machinery, boiler tubes, boiler face, rigging components, fasteners, rudder hardware, davits, sounding lead, and other material. Due to this site's association with the history of Midway and the story of the heroic rescue voyage, and the uniqueness of this site's material culture in terms of Civil War technology and transitional oscillating steam engine design, this resource has high potential for nomination to the National Register. The underwater survey of the Saginaw site provides images and data to be shared with the public. The survey also begins the in situ artifact inventory for the purposes of monitoring and management of this protected resource. As a Navy vessel, the artifacts of the USS Saginaw remain property of the federal government, protected by the Sunken Military Craft Act. 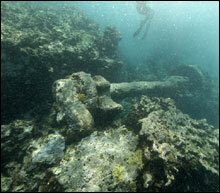 The wreck lies within State waters, and is part of the Northwestern Hawaiian Islands Marine National Monument. Though broken amidst the reefs of the most remote coral atoll in the world, the site of the USS Saginaw still speaks of the bold ambitions of America's "Old Steam Navy" in the Pacific. To learn more about the expedition click here.